Guaranteed response from our experts within 1 hour. Tell us about your project and we’ll get back to you with details on how we can develop it. Just give us a call now. Download the amazing app to learn more and start connecting! VIPsnips is the premier mobile app that allows YOU and the fan, to interact with your favorite athletes and celebrities through personal video engagements. Simply log into the app, see which of your favorite athletes or celebrities is online, and sign up to engage with them. It’s that simple! Do you have a favorite athlete or celebrity? Have you ever wished you could engage with them personally and never knew how? Is there a burning question you’ve always wanted to ask but never had the chance? Are there friends and family you would love to surprise with a special message from their favorite star but never knew how to make it happen? If the answer is “YES” then you are not alone. Fans everywhere are eager to engage personally with their favorite Stars. Despite their best efforts to fight the crowds at events, spend hours waiting outside the locker room or backstage, and countless social media posts vying for a response, it never seems to work out. Now it will, with the services offered through VIPsnips! We are working hard to gather big Stars to bring to you! 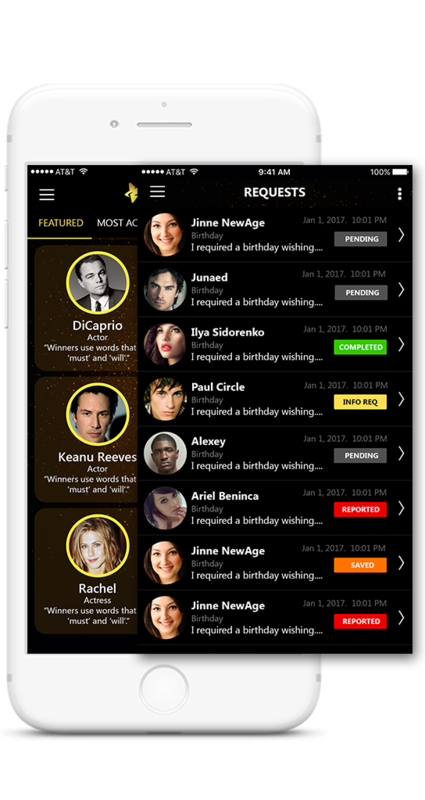 When your favorite Stars post their availability, be the first to request a personalized response. When you get a video from a Star it is yours to download and share as you wish! PHP: PHP stands for Hypertext Preprocessor and is a server-side programming language. There are many reasons to use PHP for server side programming, firstly it is a free language with no licensing fees so the cost of using it is minimal. PHP can also run on Windows, Linux and Unix servers. Java: One of the main reasons Java is so popular is its platform independence, which means that Java programs can be run on many different types of computers. A Java program runs on any computer with a Java Runtime Environment, also known as a JRE, installed. SWIFT: Swift is a general-purpose, multi-paradigm, compiled programming language developed by Apple Inc. for iOS, macOS, watchOS, tvOS, and Linux. Swift is designed to work with Apple's Cocoa and Cocoa Touch frameworks and the large body of existing Objective-C code written for Apple products. Swift is easier to read,to maintain, is safer, is unified with memory management, requires less code, is faster, supports dynamic libraries and has fewer name collisions with open source projects.